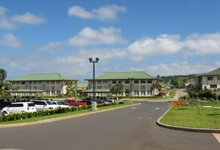 Mr. Kealii Mossman teaches in the Bussiness and Leadership Academy at Kamehameha Schools Maui. He used to be a prosecutor in which he saw youth constantly committing the same crimes. Then he thought it is important to lead to the right path before it is too late, so he changed his career to become a high school teacher. We would like to applaud him for his contribution to our communities in Hawaii. This is the Maui Mikoshi designed by the students of Kamehameha Schools Maui. 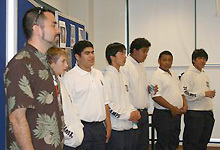 Mr. Kealii with his students. The Honolulu Festival Foundation had an opportunity to interview Mr. Mossman. What kind of procedures did you take in entering for the 5th Annual Maui Mikoshi Design Contest? We’ve showed a video clip of the Honolulu Festival to the students in one of the Japanese classes (we have 2 Japanese classes consisting 15 students per class) right after we’ve received the notification about the 5th Annual Maui Mikoshi Design Contest to deepen students’ understanding about the festival. Most of the students didn’t know about the Honolulu Festival. Afterwards, we’ve explained about the Japanese mikoshi to them and brainstormed our ideas based on the theme of this year’s festival. It is a wonderful thing to have a theme. Also, we instructed the students to ponder on it for 2 weeks and then consult with their peers. Furthermore, the students were asked to regroup and each of them was given the copy of illustration of mikoshi. Then, the students wrote a short explanation about the meaning behind their design. Each group presented their design to another Japanese class which was put into a vote by the students. The design with the most votes was chosen and incorporated various ideas which were done by all of our team efforts. What were some of the ideas that came up when you guys were discussing about this year’s theme of “Experience the Wonder”? 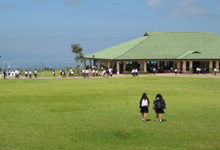 All of our students are from Asia-Pacific countries including Hawaii, Fiji, Tahiti, Samoa, Tonga, China, Philippines and Japan. 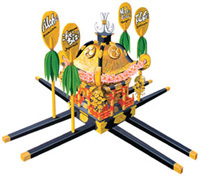 Then, we thought of incorporating those cultures into our design which was well represented in our mikoshi. What is the number one question that your students have when you’re teaching Japanese language and culture? The students of Kamehame Schools are required to wear a uniform every day, so anything that is informal can be appealing to them. During the last fall vacation, we took some of the students to Japan. They showed interest in traditional Japanese culture but they were more attracted to Japanese modern technologies and fashions. They favored “A Bathing Ape” which is a Japanese clothing brand founded by one of the famous DJ. Also, the students love manga and anime in which they were standing and reading at the store. 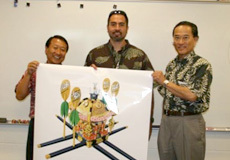 What were some of the comments from the previous students that won last year’s Maui Mikoshi Design Contest? Our students from last year enjoyed Honolulu as well as the Grand Parade. They and students from the other classes were also eager to participate this year. It is such a new experience for the many students to participate in the parade and proudly present their winning Maui Mikoshi to a large audience. What do you think the students can gain from participating at the Honolulu Festival? They can experience great things. It’s that Grand Parade! That excitement and the loud shout of “wasshoi” is such an unforgettable experience. Also, after we return to Maui, the students will be motivated to learn, which many of them advance to Japanese language level 3 and or 5 in their elective class. You’ve mentioned that you were a prosecutor, but you changed your career to lead the youth to the tight path. Please tell us more about it. I studied law at Brigham Young University (BYU) in Uta and then worked for Deloitte & Touche in Los Angeles from 1999 to 2001. After I returned to Maui, I clerked for Judge Shackley Raffetto and worked as a prosecutor. I have been interested in the field of education, so I went to BYU for my internship to obtain my law degree instead of working at the law firm. Every day, I saw the troubling youths in Maui that committed crimes. Many of them were Hawaiian like me and they were high school dropouts in which they lacked education. I was able to see the consequences of neglecting education in person. 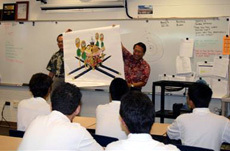 My opportunity to help out Hawaiians came during the time when Kamehameha Schools Maui was opened. My goal is to keeping the youth out of the justice system. Do you miss those days when you were a prosecutor? Yes, especially when I’m teaching the subject of law. However I do enjoy teaching business, law, marketing as well as International Studies. It is very fun. Also, we won the second place in the Mock Trial Competition last year. We know that your students are anticipated to travel to Hawaii for the Honolulu Festival. Do you have any specific plans? We have plans such as taking the airplane, staying at the hotel and go swimming in the pool of the hotel. Also, we are planning to catch The Bus to go to the Ala Moana Shopping Center. For your information, the public transportation was recently built in Maui. 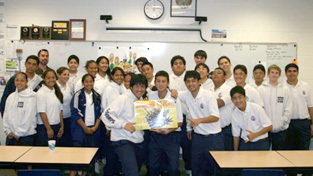 We are looking forward to welcoming Mr. Kealii and his students at the 14th Annual Honolulu Festival.